A gentleman panhandler. One of the pioneers of Canadian animation. Oscar nominee. Poor beggar. An artist unable to create. God observing the world. Fallen angel. Arrogant. Shy. Broken. Not destroyed. Ryan, directed by Chris Landreth, hovers between animation and documentary, and defies easy definition. It is based on the life of Ryan Larkin, a Canadian animator who, thirty years ago, at the National Film Board of Canada, produced some of the most influential animated films of his time. Today, Ryan lives on welfare and panhandles for spare change in downtown Montreal. How could such an artistic genius follow this path? In Ryan we hear the voice of Ryan Larkin and people who have known him, but these voices speak through strange, twisted, broken and disembodied 3D generated characters...people whose appearances are bizarre, humorous or disturbing. These appearances reflect Chris Landreth's personal world of "psychological realism." A world encapsulated in the words of Anais Nin: "We don't see things as they are. We see things as we are." 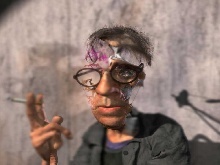 Ryan was conceived, developed and animated in the world of 3D computer generated imagery (CGI). Although the characters and sets have detailed realism, everything in the film has been modelled with CGI tools- there is no live-action footage. All characters in Ryan were animated by hand (there was no 'motion capture' used in the film). 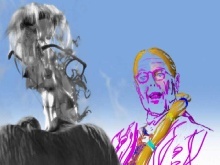 A number of software tools were used to create interesting 'effects,' such as smoke, fog, distortions, clothing and dynamic hair on the characters. 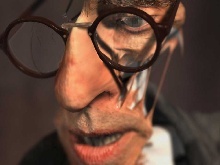 The production of Ryan relied heavily on Alias's Maya animation software (V 4.0) for modelling, rigging, animation, lighting and rendering of the 3D world in the film. In addition, we used Discreet Combustion V2.1 for all compositing and 2D effects, Adobe Photoshop V7.0 for painting and texturing, and Adobe Premiere for creative development and editing. Chris Landreth went into animation as a second career after a stint as an engineer. He received his MS degree in Theoretical and Applied Mechanics from the University of Illinois in 1986. For three years he worked in experimental research in Fluid Mechanics at the University of Illinois before making his leap into computer animation. In 1994 Landreth joined Alias|Wavefront, where it was his job to define, test and abuse animation software, in-house, before it was released to the public. In addition to well-mannered software, this work resulted in the production of animated short films, including The End (1995) and Bingo (1998). In his surreal short The End, the animator discovers he's the character in his own work while trying to think of a decent ending for it. (It will not be the first time that Landreth challenges the illusion he is trying to create.) Bingo is a five-minute computer animated adaptation of a live theatre performance called Disregard This Play by the Chicagobased theatre company The Neo-Futurists. The recorded audio performance of this absurdist play was used in Bingo, which then incorporated bizarre visual imagery and exaggerated characterization to support the telling of the story. The End and Bingo have received wide international recognition and numerous awards, including an Academy Award nomination for The End in 1996 for Best Animated Short Film and a 1999 Genie Award for Bingo. In his current film, Ryan, Landreth turns his attentions to a biography of animator Ryan Larkin, while at the same time challenging our notions of documentary and animation. 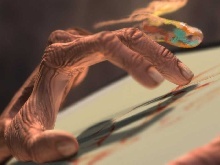 Landreth is arguably one of the most imaginative filmmakers working today in computer graphics. He gives us interpretative visuals that go beyond "photo-realism" into a pioneer realm where the visual appearance reflects the characters' evolving "pain, insanity, fear, mercy, shame and creativity." A realm that he calls "psycho-realism." Text originally published in ArtFutura's 2004 catalog.